In 1990, Gregory Booth published an article in the journal Ethnomusicology (34/2) called “Brass Bands: Tradition, Change, and the Mass Media in Indian Wedding Music”. Sixteen years later (in 2006), he turned this fieldwork into a book called Brass Baja. Booth discusses the context of a baraat (sometimes seen as barat), “a procession from the groom’s house to the home of the bride.” (1990, 245) These processions are typically accompanied by brass bands. As the author discusses to great length in both the article and book, there are a lot of interesting questions to ask about these brass bands. The concepts of tradition, acculturation, identity, nationalism, musical migration, and the general exchange of music and musical ideas can be brought to the table here. There can also be parallels drawn with the brass bands of New Orleans. Certainly this is indicative of their early European/UK roots wherein brass bands would be sponsored and associated with specific areas. Later in 19th century New England (U.S.), these brass bands, having migrated from Europe, were woven into the fabric of the Industrial Revolution – I can retrace this to my own roots by looking at the South Barre Brass Band, and the Barre Wool Brass Band (both in Massachusetts), both of which have familial ties. For many years I performed in the Quabbin Community Band, a group that evolved out of the two brass bands above that still maintains its roots by performing the works of its original bandleader, Severino D’Annolfo. 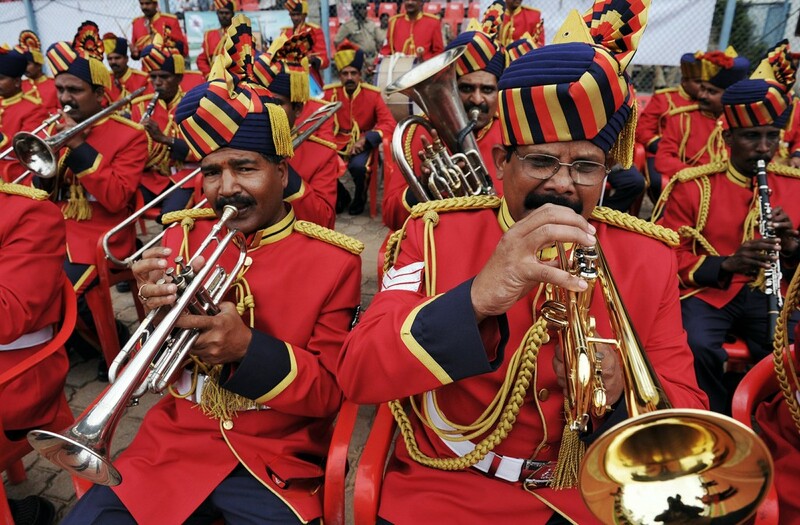 Booth recalls major Indian cities as having between 30-100 uniformed brass bands, and that they “band together” in certain areas of the cities – territories, if you will. This is certainly not unlike the brass bands of New Orleans, which are often decorated and territorially sound. That is, in New Orleans quite often, the brass bands are defined by their neighborhood associations. Their band names and lyrics are wrought with these neighborhood references. A distinction of the Indian brass bands however, is that they generally have ties to a physical space in which to store their horns, their instruments, and likely as a place to rehearse. According to Booth, they have these “shops” that are clustered together for pragmatic reasons: it is a place where potential patrons can find the group and hire them for their services. While New Orleans brass bands typically play for funeral services, these Indian brass bands play for weddings. Notably, instrumentation between these groups are very similar: percussion, sousaphones, clarinets, saxophones, trumpets, and trombones are the commonly seen axes. Certainly there are more parallels to unravel. As a brass band enthusiast, and dare I say “scholar”, it would seem that a potential study hangs here – I can imagine there are more lackluster topics to attach yourself to in comparison to this. So I’m adding it to my list. We’re getting ready to perform a kecak “piece” complete with a costumed cast of characters from the Ramayana along with the monkey army. Kecak is an odd animal. Created in the 20th century with the help of a gay German painter living in Indonesia (Walter Spies), Kecak is a vocal gamelan that mimics the colotomic structure of a typical instrumental gamelan. Basically, it was used to enhance tourism, however it does have roots in an exorcist ritual. In an article published in 2009, M. Bakan coins the phrase “schizophonic transmogrification” in relation to Balinese Kecak. In essence, this is a process wherein a ritual is recreated or reinvented in a completely different context than the original, and most importantly, that the event is used “to evoke the strange, and often the grotesque and sinister as well.” (Bakan 85) He discusses the use of Kecak in two films: Fellini’s Satyricon and Blood Simple. Here are two clips of kecak in these films. Notably, Satyricon is set in ancient Rome. As stated, kecak is an interesting animal. Although it’s not an ancient ritual, it’s become woven into the fabric of Balinese culture over time. Someone mentioned to me the other day that it seems as though only men perform kecak, and it does seem that way. Rare female gamelans have started to emerge in the past twenty years or so in Bali, so I wonder if we’ll see this same adjustment with kecak. Notably however, perhaps it simply has to do with the “ripe” timbre of the male voice for this type of “performance”. My partner and I bought a new car earlier this week. Soon after, she had to fly to NYC to hear several auditions. Yesterday afternoon when she came home and unthawed a bit, we decided to throw the dogs in the car and drive aimlessly around Florida. The dogs, in their road-trip bandanas, relax comfortably in the back of our small SUV with the seats turned down, curled up on blankets and surrounded by their beloved toys: the multi-squeaker alligator, nylabones, and a sullied tennis ball – the latter of which our dogs wouldn’t dare venture anywhere without. After all, opportunities do arise. We tend to do quite a few weekend road trips. Our car conversations are varied of course, and interspersed with dreadful singing from both of us depending on the playlist. This weekend we’re driving in the spirit of Carnival. Our favorite parade rolled last night in New Orleans– Krewe du Vieux. Every parade has a theme, but to us, Krewe du Vieux represents the grassroots world of New Orleans. The theme is generally a parody, always raunchy, generously liberal, grimy, and generally in bad taste. I love it. This brings up many New Orleans memories. I sat in the car and wrote several memories down as they came up while my partner was driving – suddenly I had 4000 words, far too much for a blog post here. I think I’ll create a short series, break them up, and post them once in a while. I don’t want to forget them, and I’ve already forgotten so much. My grandmother always had a diary she wrote in before she fell asleep, and on the first page she wrote “Lest I forget what I have done”. She wrote down what she did every day, always afraid that one day she would start forgetting. She never did.